Folklore has it that nearly three hundred years ago, sometime in the 1760’s, a group of Bedouin tribes on camelbacks gave chase to a deer in the desert. As the deer sped through the brown sand it unwittingly led the Bedouins to a sparkling blue sea. The spellbound Bedouins mesmerized by the sight dismounted the camels. They let the deer escape but took the land instead, for the land pointed them to something more important than food itself in a desert – it showed them precious watering holes. The grateful Arabs named the land ‘Abu Dhabi’, Arabic for “father of the deer”. As their brethren settled along the coast of what today is called the Persian Gulf and Gulf of Oman, a series of principalities called Emirates were born. Among others, the Arabs imaginatively named them Ajman, Dubai, Fujairah, Ra’s al-Khaimah, Sharjah, and Umm al-Quwain. While the independent emirates had been in existence for centuries and shared close bonds with each other, they decided to come together along with Abu Dhabi as a single nation, christening themselves as the United Arab Emirates (UAE) in 1971. Although a single nation, each of the seven emirates is ruled independently by hereditary rulers with Islam as the official religion. Just over 40 years old, the UAE might be passed over as a young nation. But make no mistake. Combining the centuries-old resourcefulness of the Bedouins, the wisdom of sea-faring traders, the bounty of oil resources and the marvels of foreign expertise, the UAE is making economic strides like a giant. Today, the group of tiny emirates is the second largest economy in the Arab world behind Saudi Arabia, ranks amongst the top of the world in terms of income per capita, and serves as the gateway connecting the developing East with the developed West. A Dream in Hand: The United Arab Emirates (UAE) has combined age-old wisidom and modern technology to create a booming economy. These strides have undoubtedly attracted the eyes and the wallets of the world’s investors. Wealthy Russians, cash-rich Saudis, and nouveau-riche Chinese are scrambling to invest their newfound wealth in the tiny emirates. Indian laborers, Philippine maids, and British teachers are congregating inside air-conditioned rooms overlooking expansive sand dunes to seek opportunities in the UAE. What makes international investors increasingly trust the UAE with their capital? Why is labor – skilled and unskilled – flocking to the UAE? The UAE’s history and culture will reveal the answers. The emirates’ history is etched in its trade and cultural links with the outside world. Its role as a trading post is not a new one. With the coming of age of Islam in the sixth to eighth century, Arab traders increasingly vied for a central role in the trade between the Europe and Asia powers. One of the world’s most enduring trade links in human history, the Silk Route, was only a few hundred miles away from the emirates. As caravans loaded with silk, jade, tea and spices started from the Middle Kingdom and proceeded through the rough-hewn roads of Persia, Arabs readied their camels to talk business. Later, with the advent of cargo-carrying vessels, the Arabs set sail in the trade winds with not just their merchandise but also their philosophy and religion. Some of the ports in the emirates also gained prominence as military posts. The wealthy port of Julfar, located in the modern day emirate of Ra’s al-Khaimah, was used as a springboard to expand into nearby territories. Naturally, the strategic importance of the emirates attracted the interests of the then rising European and Asian powers. The Portuguese, the British, the Ottomans and even the Saudis and Persians too wanted a slice of the emirates. However, it was British rule that endured in the emirates for the greater part of the twentieth century. As a result of these influences, the Emiratis form an ethnically diverse set of polity. Pearl in the culture or cultured pearls? During the early parts of the 20th century, the emirates were a poor nation. Even as the British manned the oceans around them, directing their wealthy ships to the Indian subcontinent, Emiratis struggled to produce bounty from their soil. The harsh climate of the desert meant little possibilities for agriculture. Other than some date palms around oases, the barren land yielded little else. Confluence of Faith: The UAE went through a series of invasions, and as such, has acquired a diverse ethnic mix. 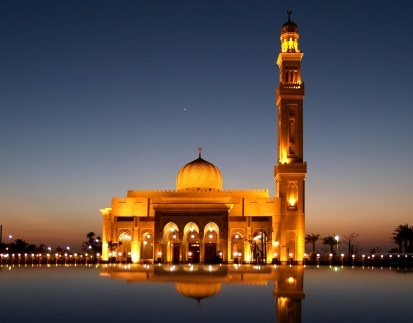 Islam is the country’s official religion, with mosques dotting the country. But what the Emiratis could not accomplish on their soil they made it up working their waters: they created an industry by exploring the deep seas for pearls. At least one male member of each Bedouin family would duly arrive at the coasts of Abu Dhabi and Dubai for a period of four months in the season of pearling to mine for pearls in the sea. A hundred years ago in the Persian Gulf, Emiratis would line up the shore and descend down the calm sea up to a depth of 40 meters and try to get their hands on as many pearls as possible in the roughly 90 seconds they could hold their breath. Once the divers reach the surface scrambling for breath, they would fill up their lungs with more air to descend again for pearls. A typical pearl diver made 30 trips to the bottom of the sea every day observed a British expatriate who happened to watch the spectacle. The pearls that Emiratis mined typically found their way to British India. The pearl industry along with fishing was one of the key industries that sustained the emirates. The Arabs took great pride in their pearl-diving culture. Alas! The pearl industry collapsed almost overnight in the mid-20th century. The advent of the cultured pearl invented by the Japanese and a ban on pearl imports by the newly independent India put an end to that industry in the Persian Gulf during the mid-20th century. It was at this moment of despair, the Emiratis stumbled upon gold – black gold to be precise. Oil reservoirs found below the quiet sand dunes transformed the land above them on a scale not imaginable only a decade ago. Beginning in the 1950’s, quiet villages engaged in camel-herding and date-farming saw oil derricks and dredgers arrive by the dozens. Not only did the oil-find change the perception about the UAE in the eyes of the world but also the internal dynamics of the Emirates itself. During the 1900’s, Sharjah was the most populated and powerful of the Emirates and Abu Dhabi was one of the poorest. The oil-finds in Abu Dhabi and Dubai raised them to the fore while oil-poor emirates such as Ra’s al-Khaimah were sustained only through coal quarrying and ceramic manufacturing. Other small emirates that are sparsely populated created property and tourism industries around them. Abu Dhabi, Dubai and Sharjah together account for over 85% of the Emirates’ population of 9.2 million and nearly all of its GDP. Abu Dhabi’s oil wealth and Dubai’s relatively diversified economy sustain the wider Emirates through transfer of tax and oil revenues. In recent days, the dynamism of these two economies has come to bound the UAE together and define its economy. Since the mid-60’s, Abu Dhabi started accumulating petro dollars. Dubai on the other hand experimented with a series of unprecedented economic initiatives that was viewed as radical in the Arab world, whose politics was dominated by hereditary monarchs. Rome wasn’t built in a day. But that was advice the rulers of UAE would not have. They were in a hurry and they had reasons to be. The UAE’s rulers understood that their oil wells would one day run dry. What’s more, the economy’s dependence on a single commodity, oil, would subject the country’s economy to the mercy of oil prices. Blooming Desert: Dubai and Abu Dhabi have embarked on construction spree in the desert. Over the past two decades UAE’s deserts have been transformed into a megalopolis with millions thronging the nation. The UAE wanted a diversified economy, acknowledging that investors generally handsomely rewarded growth that came from different engines. With this, Dubai took the initiative and today it is regarded as the showpiece of what UAE has accomplished and what it is capable of achieving. Beginning in the 1980’s, Dubai embarked on a series of property rights reforms. At a time when many Arab monarchies severely restricted land rights for foreigners, Dubai loosened them up. It lured the wider world’s investors with the promise of tax-free salaries, light corporate taxes and a business-friendly environment, creating a boom in its property market. Together with Abu Dhabi, Dubai invested more than a fifth of its national budget on education to create a services economy. It recently distributed over 14,000 iPads to university staff and students in an attempt to create paperless universities. Emiratis have taken the English language to heart as well. There were two other factors that helped the UAE’s rise to the top. 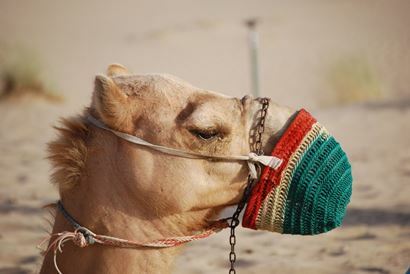 Desert’s Beast of Burden: Despite the modernity that surronds the UAE, the humble camel still carries thousands of Arabs around in the desert. The first one was technology. It arrived relatively early in the 1970’s. Just as railroads of the 19th century saw cities expand around them, the age of inter-continental flights helped Dubai’s ascent. Dubai became the meeting point, conveniently sandwiched between the mercantile classes in the East and the global capital of the West. Businessmen from India and Russia and expatriates from the U.S. and U.K. discussed business strategy at sea-front hotels in Dubai. The Gulf world’s other rich citizens from Saudi Arabia and Iran frequently visited Dubai’s myriad shopping centers to buy things that were not available or were restricted in their own countries. Indian and Pakistani cricket players who couldn’t see eye-to-eye on their soil came together to play at Sharjah, the third most populated Emirate. By one account nearly 96% of Dubai city’s population is foreign-born. Even immigrants in the truly global New York make up only 37% of the city’s population. 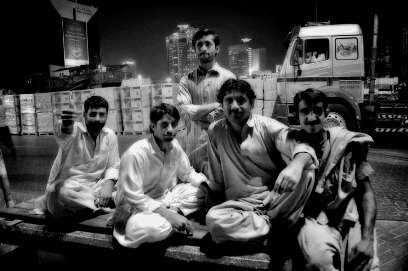 Nearly 50% of UAE’s population is made up of foreign workers. The congregation of different nationalities has increasingly defined the UAE these days. 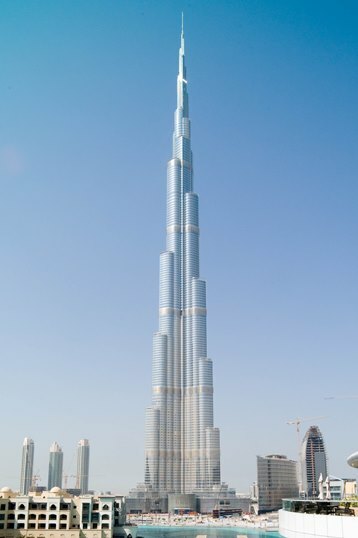 Burj Khalifa: The tallest man-made structure in the world marks Dubai’s crowning achievement. Further, of the world’s roughly seven billion inhabitants nearly four billion live within an eight-hour flight from the UAE. Out of this demand, Dubai managed to create a boom in aviation services. Two of the UAE’s airlines – Emirates from Dubai and Etihad of Abu Dhabi – are the supreme lords of the Middle East’s skies and are fast conquering the skies of other parts of the world much to the consternation of legacy carriers in the West. Dubai wants to diversify its economy further by developing itself as a hub of Islamic financing and establishing itself as the media center for the Middle East. Now, the world’s largest media outlets use Dubai as their source for gathering news in the Gulf region. If technology brought the first wave of growth, a second wave of capital beginning in the 2000’s solidified the gains for the UAE. 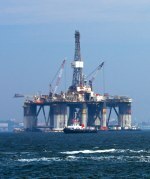 The UAE had one advantage over many countries when it struck oil in the mid-20th century. The petrodollars flowing in obviated the arduous savings-investment cycle that other not so fortunate countries had to endure. With capital flowing in, the UAE had to put that to good use. And for the most part, the UAE did put the capital to good use. But a larger wave of capital would still be better. That wave of capital too flowed into the UAE, and to Dubai in particular. Soon after 9/11, the U.S. instituted stringent anti-money-laundering laws that restricted unaccounted capital. This move unwittingly proved to be a boon for the UAE. Newly created wealth from the Gulf, Russia, Central Asia and other emerging economies found a home in the UAE. Flush with capital, Dubai went on a building spree in the desert. Dubai Metro: Initially derided as a ‘white-elephant’, Dubai Metro today is bustling as it cuts across the desert sand. Artificial islands designed like a palm tree sprouted in the sea. A metro rail cut through the desert in a city with only two million people. 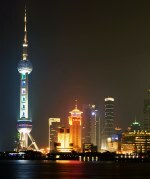 Some of the world’s tallest towers stood upright in a matter of months. Many economists sounded out warnings over the pace of Dubai’s growth in the mid-2000s. Even the other emirates were worried about Dubai’s huge risk appetite. Concerns over a property boom abounded. Economic commentators opined that Dubai’s construction binge was more a matter of pride than one built on economic sense. The crisis did arrive. As the world was left reeling in the wake of the financial crisis of 2008, global capital pulled back from all investments risky. Dubai was no exception. Capital flight shook the foundation of some of Dubai’s swankiest towers. Interestingly, some of the world’s tallest towers that were started at the heights of optimism were completed during the precipitation of a crisis. Five of the ten tallest towers of New York of the early 20th century were started in the Jazz age and came to fruition at the depths of the Great Depression. Dubai’s tallest tower, Burj Khalifa, then named Burj Dubai, was no different. When it finally opened in 2010, the tower was mostly empty and lonely. The world was nervous about Dubai defaulting on tens of billions of dollars. Debtors left Dubai for good dumping their cars in the airport parking lot. Workers of the World: UAE has been a magnet of opportunity for both skilled and unskilled labor. The country’s construction boom attracts labor from across the world and in particular from Southeast Asia. When everything seemed to go awry for Dubai, it was Abu Dhabi, which had conserved its cash all this while, that came to Dubai’s rescue. The help from Abu Dhabi saved the day for Dubai and helped the recuperation of entire UAE’s economy. Still, yesterday’s excesses have proven to be today’s foundation for growth. Referring to Dubai’s crisis in 2009, Harvard University’s Edward Glaeser wrote in the New York Times that “structural legacies of (empty buildings) remain, providing the space that connects humanity and facilitates the success of our world”. Mr. Glaeser’s words could not have been more prescient. Dubai bounced back. In the six years after the crisis, many of the projects that were derided as white elephants in Dubai have proved their mettle. Burj Khalifa is not empty anymore. 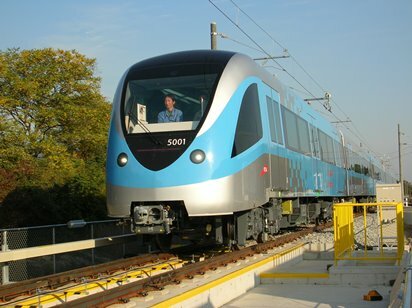 The Dubai Metro carries nearly 300,000 passengers a day. Emirati hotels now struggle to find places for the roughly 11 million tourists visiting the country each year. Even the normally conservative and cash-rich Emiratis from Abu Dhabi are now eager to replicate Dubai’s model to achieve diversification within the UAE. Abu Dhabi is building a museum inspired by the Louvre in Paris and Guggenheim in New York at the cost of more than a billion dollars. 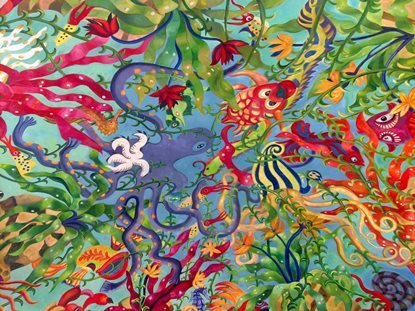 Contemporary yet Classic: Abstract painting from a museum in Dubai. The UAE is projecting soft power by investing in billion dollar museums modeled on the Louvre in Paris and New York’s Guggenheim. The UAE’s economy has been on a steady uptick over the past three years. 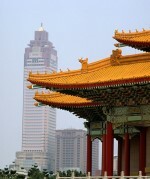 Property prices have soared, foreign investments have ballooned, and oil production has surged. The International Monetary Fund expects the UAE to grow between 3.9% and 4.4% in 2014 despite warnings over an overheating property market and inflation. Structurally too UAE is making progress, ranking 23rd amongst 189 countries in terms of ease of doing business. Dubai has created several free zones where foreign firms will be allowed to own 100% of their businesses with a promise to look at insolvency and ownership rights. The UAE might not be the largest economy in the Arab world. That title belongs to Saudi Arabia. But many feel that the UAE is the more sophisticated and diversified one with an array of industries such as finance, tourism, media and oil. The UAE has created more investable companies than many other Arab countries over the years. It recently climbed the rungs up to the more sophisticated MSCI Emerging Markets index from the MSCI Frontier Markets Index, which typically includes companies with low market capitalization and liquidity. Chasing a deer some three hundred years ago has served the UAE. Today global capital and labor are chasing opportunities in the UAE today.